Economic activity in the Cayman Islands as measured by the gross domestic product (GDP) in real terms is estimated to have grown by 3.7% in the first six months of 2018. The strong economic performance was contributed by all major sectors with the highest growth rates indicated for hotels and restaurants (15.2%), construction (8.9%), transport, storage and communication (6.5%) and business activities mainly legal and accounting services (3.8%). A strong increase in tourist arrivals and financial services registration facilitated the robust growth for the first six months. Stay over tourist arrivals increased by 16.0% while new company and new partnership registrations both rose by 39.1%. Stock exchange listings also rose by 37.7% to register its highest level since June 2008. Coinciding with the strong GDP growth, the central government recorded an overall surplus of CI$178.1 million in the first half of 2018. This resulted as growth in revenue of $43.8 million outweighed a rise in total expenditure of $10.9 million. The increase in revenue was generated mainly from domestic taxes on goods and services, led by financial service fees. The rise in expenditure is traced to increases in current expenses such as subsidies which rose by 19.3%. The central government’s outstanding debt fell anew and settled at $431.5 million as at June 2018, lower than the $466.5 million recorded for the same period in 2017. 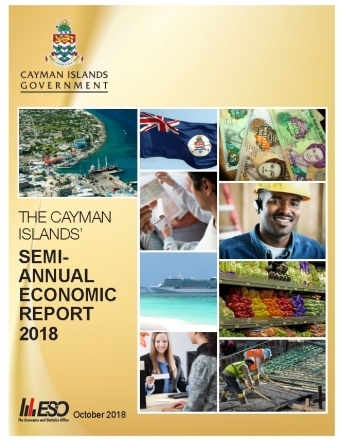 For more information on the “The Cayman Islands’ Semi-Annual Economic Report 2018,” please visit www.eso.ky.